Teen talent and pros in the business are all banding together to help discover new talent and get them on the road to stardom. Our MC is Talia Rayna. Join her every week as we narrow down the competition to get to the top 50 quarter-finalists, then the top 10 semi-finalists and then the 3 finalists who get to travel to Scottsdale for the finale. The top 3 finalists will get to go to a live television shoot at WM Studios in Las Vegas, Nevada where they will meet Talia and the rest of the crew. Since most entertainers need to be triple threats (singers, dancers, actors) our show adds new dance moves that you can watch on TV and then learn at home. Our Step Up 2 the Mic dancers are Katrina and Sloane and their crew of talented dance friends. These teen dancers host Fit for a Feast – a website and Youtube channel with over 42 million views. They are also the hosts for the online dance lesson site Dance Crusher / Hip Hop Crusher. They will be joined by other talented dancers to perform different styles of dance on many of the episodes. . You can watch them on the show and then learn the fresh moves by checking out the tutorial on our website. 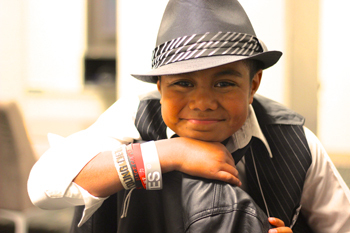 Lelea Fonua is a self-taught 12-year-old singer/songwriter who started performing at 9 years old. Lelea has performed at events for Radio Disney, major league baseball games and rock concerts, and has been featured on FOX, NBC and ABC News. He has worked with multi platinum artist Gavin DeGraw, Nickelodeon’s Ashley Argota, and Rock legend Alice Cooper. Lelea submitted an entry to an online competition for Kidz Star USA 2012. He was selected as one of eight finalists out of 50,000 entries from across the USA. As a Type 1 Diabetic, Lelea represents the American Diabetes Association as a Youth Ambassador and performs at charity fundraisers. He was recently awarded Youth Ambassador of the Year 2012. He has worked for other charity organizations like Japan Red Cross, YMCA, Young life, IROCK Philippines Flood Appeal, and the Arizona State Governors Office. Wade Martin: Producer & Studio Owner (JWM Records). Wade has been a guest judge on American Idol, has had his own song in the Top 40 and has worked closely with many record labels, recording engineers and producers. Wade has developed and produced artists such as DMX, Flava-Flav, Katy Cappella, 50 Cent, Nas, Juice and others.